digestive ailments, flus, colds and more. From the moment you walk in the door we provide you with a comfortable and welcoming atmosphere for your treatment. We listen to all your concerns and answer all your questions. We’ll continue to provide you with all the support you need throughout the treatment process. I tailor your treatment to your unique condition, needs and life circumstances. My healing focus is on the whole person. I’m committed to providing all my patients with a comprehensive healthcare experience that makes a difference in their lives. Patients who are willing to apply suggested nutritional and herbal protocols, and are determined to make necessary dietary and lifestyle changes, experience improvements in their health, vitality and quality of life improvements. My front office manager runs the office and pharmacy. She answers the phone, schedules appointments, processes pharmacy orders, takes payments, gives you receipts and invoices, electronically bills your insurance, and manages the office, pharmacy and inventory. This allows me to focus more exclusively on my patients and their cases. Together, we make Marin Optimal Health run smoothly. 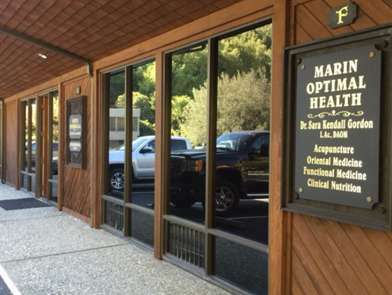 Our beautiful, newly renovated ground floor office suite is tucked into a tranquil hillside setting on the east side of Terra Linda, San Rafael (just off Hwy 101). Our office has EMF remediation so you will not be in a WIFI field. 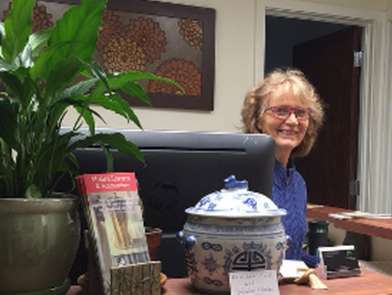 We offer a variety of services including, Functional Medicine, Oriental Medicine, nutritional counseling, acupuncture, massage, and cranial touch. We have a professional herbal and nutritional pharmacy, and provide lab test requisitions for blood, saliva and stool with lab test kits from various U.S. laboratories such as Lab Corp, Cyrex Labs, Genova Diagnostics, Diagnos-Techs, Diagnostics Solutions, Spectra-Cell, and many more. Our goal is to restore health and relieve pain in every patient who comes to us for help, and to provide them with the knowledge and support they need to achieve and maintain optimal health. If you’re suffering from pain or illness, we invite you to call our office and begin the journey to a healthier life. Before your first visit you’ll need to download and fill out our assessment questionnaires and office forms and bring them with you to the office. (See the link below.) My office manager will tell you which forms to fill out. (There are specific assessment questionnaires for children.) You can also fax these forms to our office prior to your appointment. If you have any trouble downloading the forms, call our front office and we’ll send them to you by snail mail or email, whichever you prefer. Important note: Filling out these forms can take 30 to 45 minutes. Please do this before you come, rather than waiting to fill them out in the office during your appointment time. These forms are an opportunity to examine and assess a wide range of matters relevant to your current state of health. If you thoughtfully engage the questions, you’ll have new clarity by the time you finish. This will make our visit more productive and will give me essential background information for my examination and diagnosis. I look forward to seeing you!